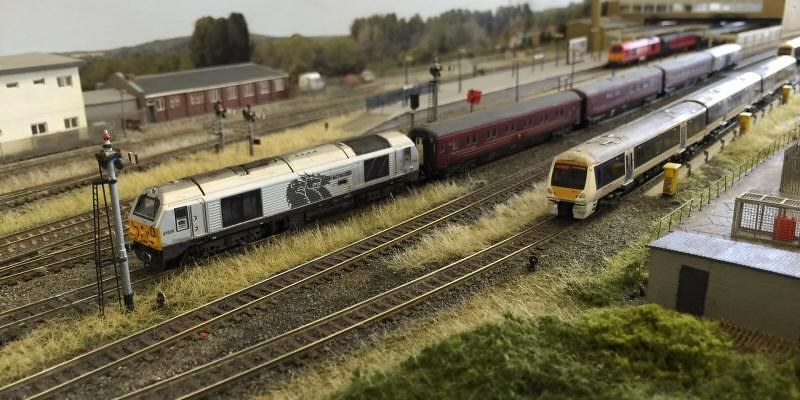 Model Trains Interactive :: View topic - THE Christmas show - Manchester 2 & 3 December 2017! THE Christmas show - Manchester 2 & 3 December 2017! Posted: Mon Jul 10, 2017 1:36 pm Post subject: THE Christmas show - Manchester 2 & 3 December 2017! of a major UK city. the LMS who was our Honorary President for 27 years. the exhibition – including 53% by train! prepares for the 82nd public exhibition in its 92 year history. 3 minutes walk from Piccadilly Station. supplies and presents for Christmas. advanced tickets will be available on-line from 1st September. more information about the many other attractions at the exhibition. It’s sure to be a great show. Annascaul (Abhainn an Scail) is a station on the 3ft gauge Tralee & Dingle Light Railway, County Kerry, which opened in 1891 to passengers and goods traffic. Spring 1939 saw the end of passenger trains and the daily goods was discontinued in 1946. This left the once monthly cattle trains as the only source of revenue and these services came to an end in June 1953. The station was one of two intermediate passing places on the railway. Collecting information for the model has not proved to be as easy as first anticipated and new facts are still coming to light. Lots of photos were taken here by railfans but buildings were obscured by stock and steam and the infrastructure was definitely not of prime concern. Four trains run representing the T & D. Watch out for others though from Irish lines, the Isle of Man and even French metre gauge. Banbury station lies on a busy cross-country route between Birmingham and Didcot, where it joins the Great Western Mainline. The Chiltern Railways mainline towards London Marylebone diverges a few miles South at Aynho Junction. There is a lot of freight traffic, mainly container s to and from Southampton. Chiltern Trains operate the majority of passenger services but Cross Country trains have two an hour each way and First Great Western have a local service that terminates at Banbury. Until January 2011 there were Wrexham and Shropshire loco hauled passenger trains. Chiltern Trains have now introduced loco hauled trains on weekdays between London and Birmingham. Peco fine-scale code 55 track has been used with SEEP solenoids to operate the turnouts. All buildings have been scratch built from plastic sheet and are as close to scale as can be from scaling from photographs. Great use of Google maps and Google Streets has been made to check proportions and locations of buildings relative to each other. Rolling stock and locomotives have been detailed and are from manufacturers such as Graham Farish and Dapol. Control is via Digitrax Digital Command Control. Turnouts are also controlled via stationary decoders. To control both the trains and turnouts, we use iPods and iPhones running an app called Wi Throttle. This then communicates with the DCC system via a wireless router connected to a laptop that runs the free software JMRI. The laptop is connected to the DCC command station using an interface called Loco Buffer. Touchscreen PC’s are used for the track plan and turnout control and showing their status. JellyModels for the launch of its product range in the UK. railways in the country at a comfortable and convenient venue. LMS who was the Society’s Honorary President for 27 years. 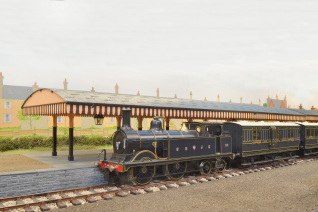 chance to win a complete model railway set! 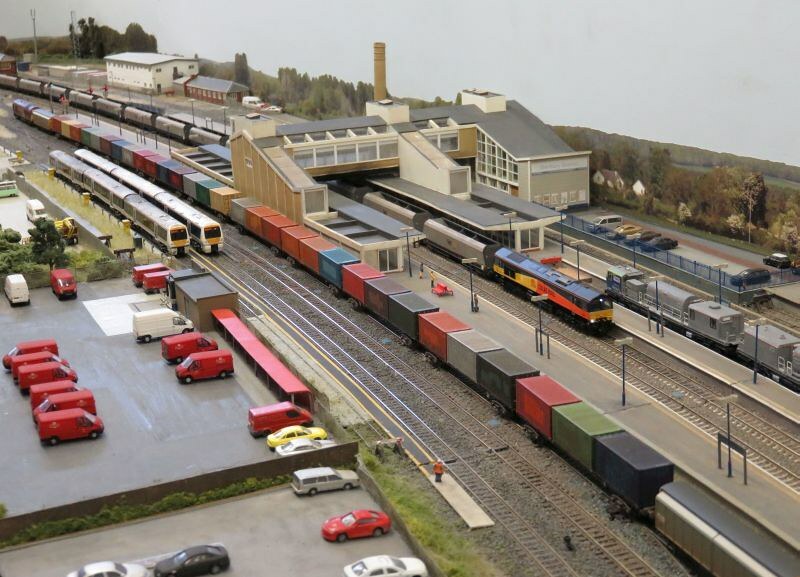 the ONLY model rail exhibition to be held in the centre of a major UK city. The line from Bridgwater to Edington was opened on 21 July 1890, being built by an independent company, the Bridgwater Railway Co. It had been ‘independent’ in name only having been promoted and operated as an extension to the S&DJR system. The station building was built of local brick and had the appearance of an LSWR design. It stood at right angles to the two-bay island platform, upon which a canopy was built covering over half its length. The goods yard, complete with shed, had ample facilities to handle many commodities including coal, bricks, tiles and livestock. A single road engine shed of brick construction was also built, together with a 50ft turntable in front of its entrance. The shed, although extended in 1898 to accommodate two locomotives, was not used to stable locomotives overnight and was subsequently leased to the Co-op in 1928 for use as a store. Until 1942 there was a 48 chain (1056 yd) extension from the cattle dock that swung through 180o to provide access to the brickworks and wharf facilities and the east bank of the river Parrett. The station was renamed Bridgwater North in 1949 when it came under British Railways ownership, to avoid confusion with the larger Great Western Railway (GWR) station in the town. 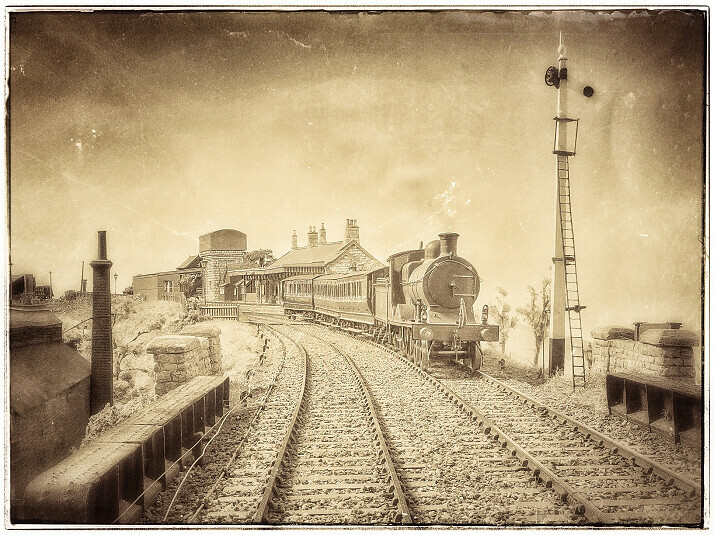 When the line to Edington was finally closed in 1954 a new spur was laid from the S&D yard to connect it to the GWR docks branch. The goods yard remained in use until 7 July 1962 and the docks branch finally closed on 2 January 1967. “The Christmas Cracker” a good looking swapmeet at the Museum of Transport, with free heritage bus from Manchester Victoria railway station. Camden MPD! For railway enthusiasts, the very name invokes nostalgic memories of this fascinating place. What boy (or even father) could resist peering out of the window of a passing train to see what was ‘on shed’ that day. Although not particularly large, being the dedicated Motive Power Depot for London’s Euston station, it was one of the few places that top link express locomotives of the LNWR, the LMS or even the early British Railways, could be seen in abundance and in close proximity to one another. Often a smokey place, it was nevertheless a thrill for locospotters to watch the non-stop action from the nearby bridge or if one was so lucky, enjoy a visit to this hall of giants. The model shown represents the northwest end of the MPD where most of the action could be witnessed. Locomotives still facing south, enter the depot from the engine line at the left-hand side and proceed tender first, to the turntable. After turning, which takes 11/2 minutes, engines reverse back past the water tank to the coaling plant. After coaling, engines pass behind the shed and workshop to the ash plant where the fire would be cleaned and waste ash discarded into skips for loading into wagons for disposal. Beyond the ashplant, locomotives proceed to the headshunt and approach the rear of the depot, chimney-first and now facing northwards, ready for cleaning and minor servicing work before preparation for their next duty. Engines requiring more serious attention are directed into the workshop behind the shed. All engines worked to ‘diagrams’ which determined their duty usage from day to day between servicing and so it is on the model. The clock shows the time of day and the relevant portion of the Depot Schedule based upon the actual requirements of the LMS Autumn 1947 timetable is displayed alongside the shed so that the onlooker may follow events. Depending upon circumstances, the clock may be stopped or speeded up. As in real life, ‘spotters’ must wait to see which locomotive is allotted to each service. The period represented is loosely from 1935 to 1947 in order to display the several liveries which LMS locomotives carried before Nationalisation. In real life, few streamliners retained their colourful livery to be seen alongside locomotives of the same class in the 1946 lined black livery. Camel Quay is a typical North Cornwall ex-LSWR station on the River Camel that could have been on the Rock-Delabole Railway had it been built. The station, with its station building, goods shed, and signal box, bears a resemblance to Padstow on the opposite side of the river. There are local pull-push passenger services and trains from Exeter and Waterloo including a portion of the ‘Atlantic Coast Express’. The quay, with its sidings, sustains a small coaster carrying china clay brought down from the local quarry in wagons and a small local fishing fleet. The High Street has a traditional public house, railway hotel and a few shops served by the local Bedford OB bus service to surrounding towns and villages. The era depicted is of the early/late BR period with typical examples of the BWT, O2, M7, T9, ‘N’ and Class 22 locos with ‘Carmine & Cream’ and BR(S) Green/Crimson coaching stock. This station in Cirencester should not be confused with the GWR terminus on the other side of town. It lay on the Midland and South Western Junction Railway running between Andover and Andoversford and linked the north and Midlands to the south coast, in particular, the docks at Southampton. Running through a mainly rural area, local traffic did not become significant, but as a through line it developed an important use during wartime and for military manoeuvres on Salisbury Plain, providing a vital link for the movement of supplies and men. During peacetime, the link to the docks provided income from seasonal fruit and vegetable traffic and to service the port and ships. The lack of income meant the company was unable to afford sufficient stock to maintain the service during peacetime let alone during wartime and they were frequently forced to borrow from other companies. They were loaned locomotives and coaches by the GWR, MR and the LSWR. During military activity, a great variety of stock could appear providing me with a great excuse for modelling almost anything I fancy. Cirencester was the workshop location for building and maintaining the company’s stock. These are under construction and they will sit behind the main station buildings. To the north, towards Cheltenham, the line is double tracked but to the south, only a single line existed. 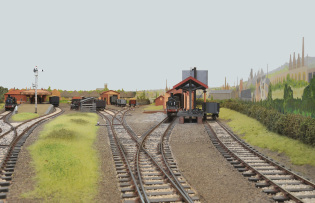 There seem to have been many changes to the track layout, with most plans that I have seen having the access to the siding behind the signal box and the works and goods shed combined, however, there is evidence that at one time there were two separate links and this is the configuration I have modelled. I have tried to date the line at around 1919 which justifies a variety of stock from other companies as well as the MSWJR itself and include some extra unusual movements. Just noticed on another forum that the tram /incline layout has had be back out. Assume something will replace? Sadly Glenngary, the funicular layout has had to withdraw due to illness but has been replaced by another quality layout of equal size. It seems that C&L are also unable to attend. I will post more on this when I receive full confirmation. It is a shame, as it was something different, a rarity at some exhibitions these days. Hopefully it will be something 'different', not just another normal(even if it is excellent quality) layout. 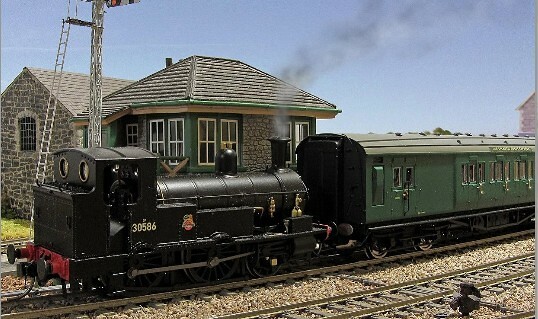 Sadly it happens, Franke C has had to drop out of Warley with his Swedish(I thought it was originally Norwegian) small but large scale narrow gauge layout due to illness, and it is an N gauge British layout replacing it. I would prefer to see something in the same ilk as substitutes. Hopefully, you will find our replacement more to your taste! Also, on the traders front, unfortunately, C&L models will not be able to attend either. Now that is worth getting up early! Pity the exhibition web page has not been updated yet. Franklin is the latest part of my foray into North American narrow gauge modelling, and is the portable terminus of a small 2ft gauge branch line up the Kettle River valley. At home, this feeds into my 220ft long 3ft gauge mainline depicting narrow gauge operation in the Rockies of British Columbia. 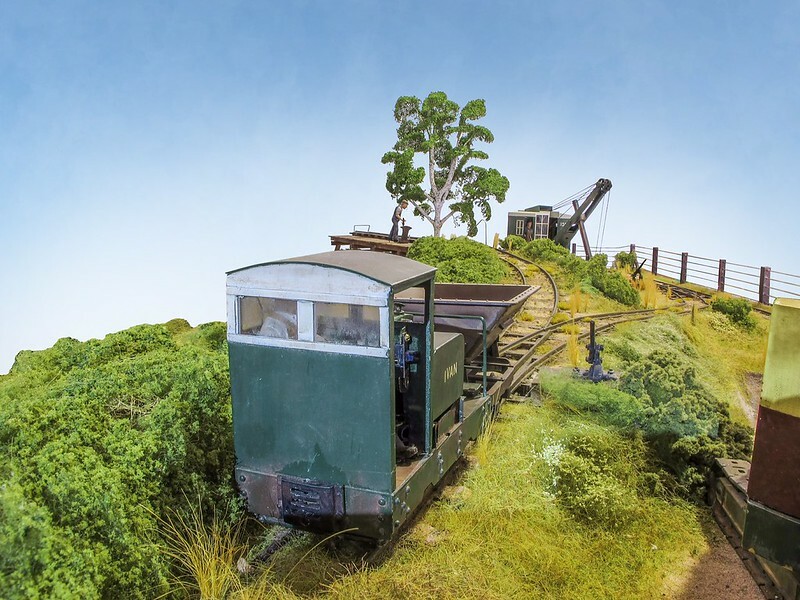 This new section is based on the 2ft lines in Maine, USA, and was originally inspired by the exquisite Bachmann models of the typical Maine Forney tank engines. 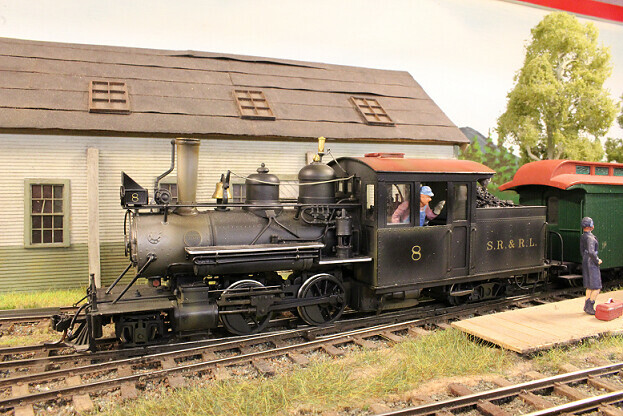 The station is mainly based on Bridgton, on the Bridgton & Saco River Railroad, but some of the buildings are from the Sandy River & Rangeley Lakes Railroad, both in Maine. I agonised for some time as to whether I should stick with the Bachmann 00 track gauge of 16.5mm, or re-build the locos and stock to true 2ft gauge, and the masochist in me finally won. 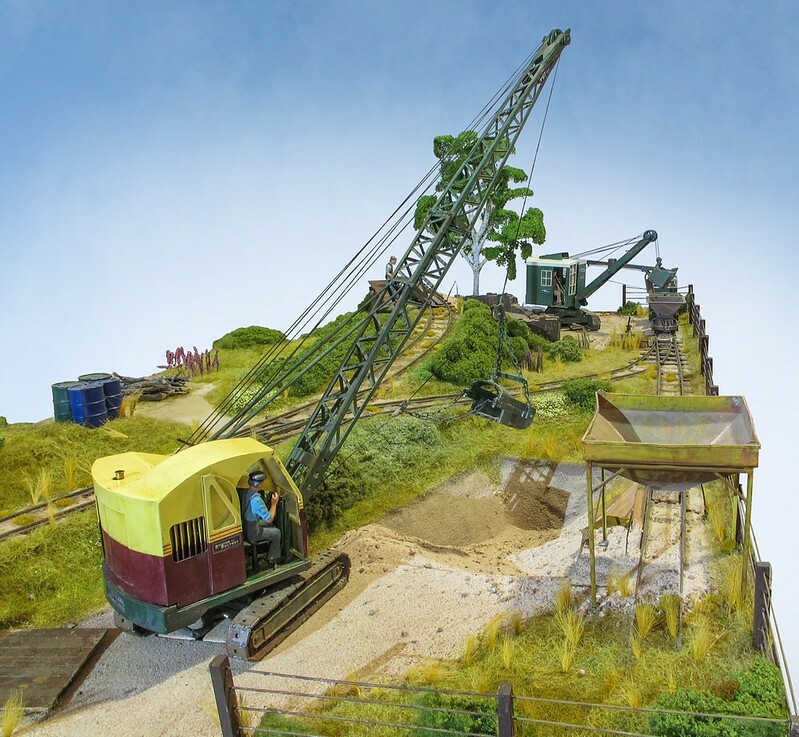 Built to American ¼ inch to the foot scale, ie 1/48th, the track is all handbuilt to ½ inch gauge. 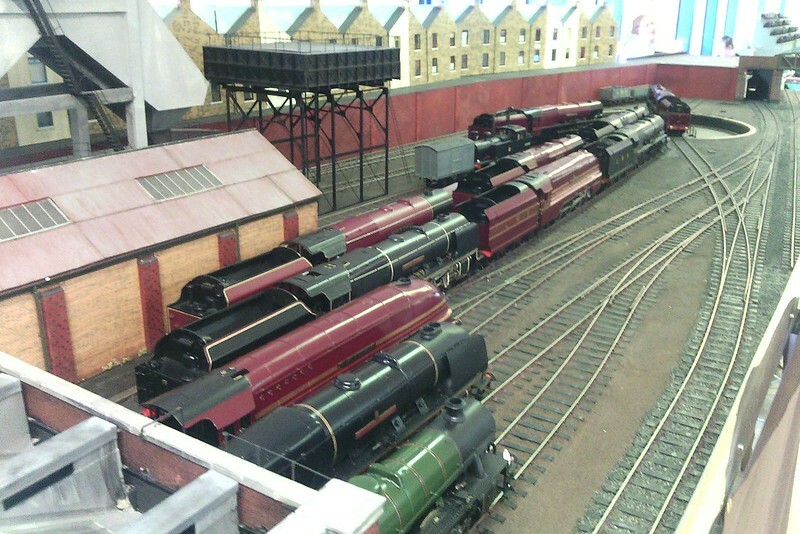 Some of the locos are re-gauged Bachmann, whilst the rest are brass imports from the Far East. Most of the rolling stock are now kit or scratch-built models of genuine Maine vehicles, with the correct long, narrow, and “hunkered-down” look of the prototype. Operation is from the front of the layout, and uses the Lenz DCC system with sound and lights in the locos.I have just moved up a technical notch, and can control the trains wirelessly using an App on my i-pad. 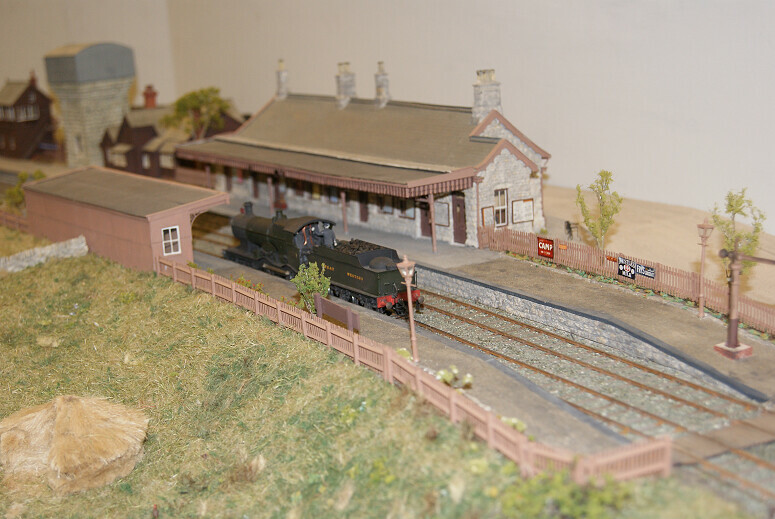 Glaisden depicts a fictitious station on the Calder Valley main line in the early 1960’s. Research into the design of stations, buildings and structures from around the West Yorkshire area has led to the island platform concept being based on Elland while the station buildings are based on Heckmondwike (L&Y). The goods shed and coal drops come from Halifax and the track plan is an amalgamation of features from Elland, Ossett and others. Structures are from a number of materials, including plastic, MDF, brass and plaster, some of which may not be that obvious when painted. The locos and rolling stock are a mixture of modified ready to run, kit built and scratch built and belong to those helping to operate the layout as well as myself. Some are typical of the 1960’s Calder Valley scene, while some rely on a bit of modellers license, for which I hope we will be forgiven. 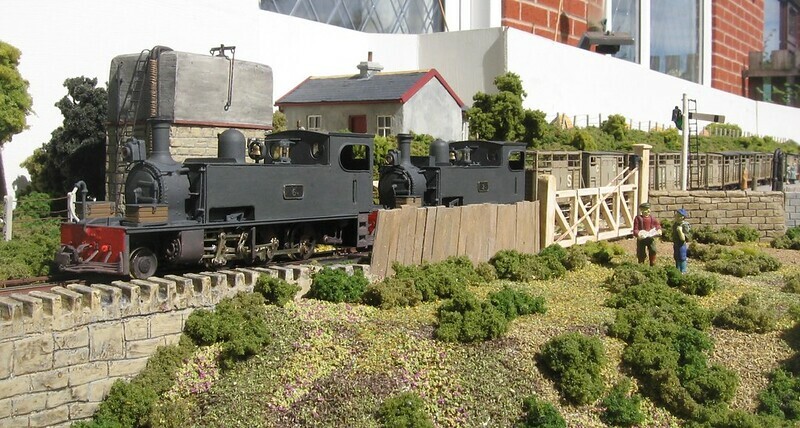 This N-gauge layout represents the North Eastern Region’s Durham Coast mainline, somewhere around Easington in the late steam/green diesel period. The old Hawthorn Dene Colliery no longer winds coal. Its winding gear has been removed and the shafts fitted with fans. The washery and screens are still in use, mainly preparing household coal for merchants and for the nearby landsale yard. Waste is still sent to be tipped on the beach, both by conveyor belt and aerial ropeway. 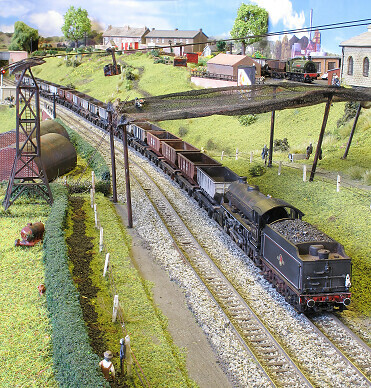 Colliery locos bring empties from the exchange sidings to the South for weighing and taking on to the screens, while full wagons are removed from the screens , weighed, and taken either to the exchange sidings or North to the Hawthorn complex. Meanwhile the main line sees a procession of expresses, local passenger, fitted goods and coal trains, which seem not to disturb the inhabitants of the pigeon lofts on the bank. Buildings are typical of the area. The underbridge is based on the one at Easington Colliery- the different parapets are a result of a partial rebuild, possibly following a derailment.